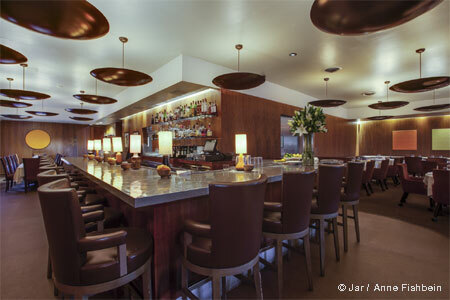 : After a major renovation, The Belvedere is back; the name is the same, but everything else is different. The dining room and outdoor area have been completely redone, showcasing a new concept and menu by executive chef David Codney, to go with an elegantly modernized classic design that's primed for a business power lunch or breakfast. The expanded terrace features a 30-foot Italian Cypress tree, French limestone fountains and an outdoor fireplace. 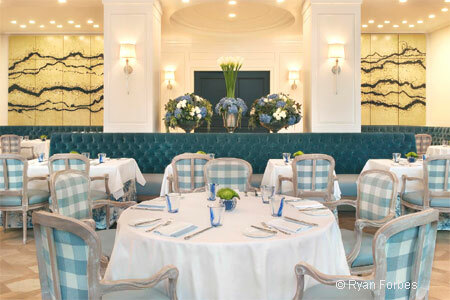 Inside, tufted blue velvet banquettes, parquet floors, periwinkle gingham upholstered Louis XV chairs and armchairs, and massive works of contemporary art are the backdrop for the Mediterranean-inspired cuisine. To start, a small tray of lightly pickled vegetables with yogurt sauce and an olive focaccia in its cocotte are brought to the table. Dungeness crab flatbread with confit tomatoes and garlic aïoli arrives warm, covered with large pieces of cool crab. Pastas are all house-made: duck confit orecchiette is packed with flavor, while the Santa Barbara uni linguini with caviar and lemon chervil butter was very lemony. The signature lamb tagine with golden raisin couscous, almonds and cumin yogurt is warmly flavorful. A local monkfish osso buco with charred Spanish octopus pleases both the eyes and the palate. For those who appreciate a cheese course, we recommend the composed goat cheese, served with Concord grapes, grape sorbet and gianduja on a bed of hazelnut cream. Desserts by pastry chef Stephanie Boswell are a standout. A refreshing honeydew Pavlova with cucumber, lime and coconut with a hint of jalapeño was almost too beautiful to eat, but we’re so glad we did. Strawberry shortcake with rhubarb gelée and sumac ice cream was homey. Be sure to request the 'Fabergé' chocolate egg. The short but creative wine list is meant to complement the current food style and an off-list reserve selection is available.